The term glass repair fools a lot of people because any broken glass in a building can not be repaired as such but has to be replaced, we use the term glass repair broadly because that is what we are doing but in fact we have to replace the broken glass with a new piece of glass. Glass Perth replace glass for the fairest possible price and workmanship is guaranteed for life. 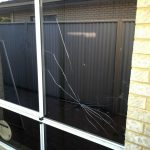 We are able to replace nearly any window or door glass installed in homes and businesses in Perth, Western Australia. Some of the more common reasons besides the terrible event of a break and enter or vandalism are balls, in summer it is cricket balls and in winter soccer balls, we have also done quite a few repairs from pool balls. Lawnmowers and being locked out cause quite a bit of broken glass. Thermal breakages are also common, when float glass is broken due to thermal stress we are able to tell it is a thermal breakage by the way the cracks run on right angles. 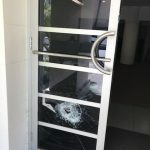 Sudden temperature changes cause toughened glass to explode, especially in summer we see glass sliding door panels exploding which usually happens if the glass is very hot and a cool breeze comes through. Heavy winds causing doors to slam in winter and timber windows expanding and becoming difficult to open or close are some other reasons. What sets our company apart from some other glass replacement services is that we are able to replace glass to a high standard because we stock all the essential items for most windows. Things like conversation vinyl which converts glass of different thicknesses to be able to fit in the same frame, replacement wheels, corner stakes and so many other parts that hold the windows and doors together and the breakage of these parts may often be a cause of the glass breakage. When house window glass is replaced most of the time to comply with the Australian standards a thicker glass needs to installed which means the rubber seal should be changed, the rubber seal does not always need to be changed but to do a truly good job when repairing a window or door using a conversion vinyl is essential. We stock all the common conversion vinyls for the thousands of different window and door types in Perth. We don’t only replace glass properly but we take the extra steps and spend the time to do jobs right. We don’t feel right if we don’t clean up and clean the glass when installing new glass. We show respect to our customers and their homes or businesses and go out of our way to be nice and respectful to the occupants of premises, their guests or customers. Hopefully if you use our service you will notice these things and appreciate us.